The Panzer I was a small 2 man training tank armed with twin machine guns and was never intended for serious combat duty. When WW2 broke out in Europe, the Germans were short of tanks so the Pz I was pressed into combat early but was gradually withdrawn from action when the more combat worthy tanks were available in greater numbers. Even though the Pz I was not a good combat vehicle, it's chassis was still useful as the basis for combat vehicles in other roles, notably as a command vehicle, mobile anti tank gun and the subject of this kit, a mobile anti aircraft gun. 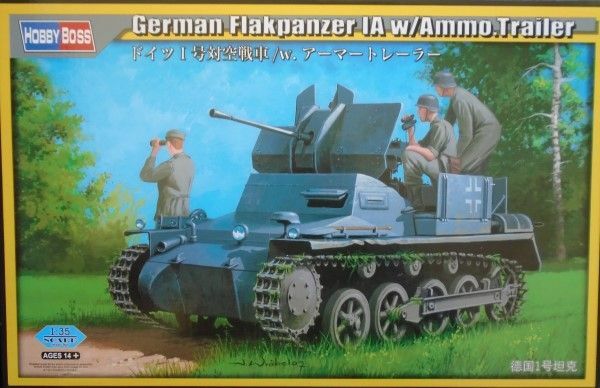 The Flakpanzer IA had the standard 20mm anti aircraft gun mounted in place of the original turret and towed it's ammunition in a small trailer. This enabled it to keep up with the German tanks and provide them with anti aircraft protection. Twenty Four Flakpanzer IA's were made and served on the Eastern Front between 1941-3 and were the forerunners of other tanks being converted into Flakpanzers. 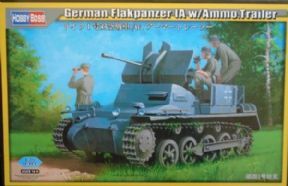 This is a highly detailed plastic kit with photo etch metal parts. The tracks are moulded in individual links instead of the old style vinyl one piece tracks. There are markings for several different tanks.